So instead of the straightforward marijuana storefronts common in Colorado or Nevada, Washington has developed a thriving “gift economy” marijuana industry. These businesses--many offering delivery--sell everything from coffee cups to artwork--all overpriced and all coming with a little something extra. In addition to the dozens of different businesses working through the gift loophole, there are now hundreds of marijuana-themed public events taking place across the city — most openly advertised on social media. One such event, known as Cannemania, happens weekly at a closed Ethiopian restaurant. Inside isn’t so much a stoner party as a fairly businesslike trade show. 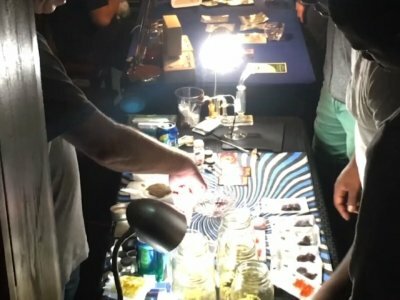 On a recent night, about 150 people crowded in to peruse about 25 different vendors’ tables offering large jars of buds and a huge variety of edibles, from brownies to marijuana-infused gummi bears. There were also marijuana vape pens and “concentrates” —a substance that looks like candle wax and requires a waterpipe and a blowtorch to consume. Despite the ubiquity of the drug, it would be inaccurate to describe the District as some sort of marijuana free-for-all. Mayor Muriel Bowser’s government has worked hard to establish clear lines on what is and is not permitted. It remains illegal to smoke in public. Arrests for public consumption have actually spiked since the legalization initiative came into effect. Bowser also personally lobbied the city council to defeat a proposal to permit pot smoking in bars or restaurants — fearing it would lead to private cannabis clubs.